I am not sure why Neil deGrasse Tyson was chosen to narrate this segment on dog intelligence, but he does a fine job. Great video, but kind of bittersweet for me to watch. Why? Because in 1992, I started a dual Ph.D. in Zoology/Biological Anthropology studying primates. 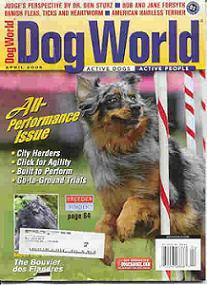 By that time, I had already been competing in dog sports for 25 years. So though I dutifully studied primates in the jungles of Latin America, I spent all my free time tailing the Latin American street dogs. Back at university, I dragged dogs into nearly every paper I wrote for classes: how dingos allowed Aborigines to thrive in ancient Australia; interactions between wildlife and street dogs in Latin America, etc. I begged my professors to be allowed to do "friendly, positive" lab research on people's pet dogs. I wanted to do exactly the kind of studies in this video: dog vocabulary research, visual symbol discrimination, etc.. I was told ABSOLUTELY NOT. They insinuated that if people saw dogs coming into the department, animal rights protestors would shut us down. (Yet they kept hundreds of captive monkeys for invasive research at the campus primate center--go figure). Every professor in both my majors told me that dogs were "not a valid research subject." They said that an anthropologist is supposed to learn about human origins. I argued dogs could teach us more about this than rhesus monkeys, but I was ridiculed and marginalized by professors, who encouraged students to do the same. This was especially hard to take because dog behaviorist Patricia McConnell had gotten her Ph.D. from the same department about 10 years before me--though it wasn't specifically on dogs. I had assumed this would open some doors, but unfortunately, it didn't help in my situation. A few months later, I quit in the middle of my dissertation and opened up a business as a dog trainer and dog behavior consultant, which I did for about 5 years. Anyway, maybe if I had been even MORE persistent back in the mid-90's, this dog cognition research would have been done a lot earlier. I now write biotech software manuals and am "too old" to return to grad school. So I totally missed the boat on doing this cutting edge dog research. But I'm glad that finally it is being "allowed" at universities. Who better to explain human behavior than another critter whose fate has been tied to ours for most of our history? Great video. I enjoyed the bit about how "Border Collies have been bred for this kind of thing." Why should this come as a surprise? Until the unfortunate co-opting of the Border Collie by the AKC, these dogs were bred to work closely with people and to reason, listen, and use their own initiative. The working Border Collie still displays those traits, while the AKC model is fast turning into a Golden Retriever in a tuxedo.